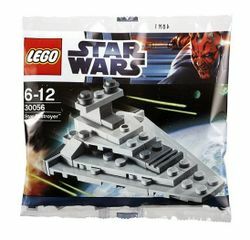 30056 Star Destroyer is a Star Wars Mini set released in 2012. The set is made up of light stone grey and dark stone grey pieces. The base of the set is a large grey wing, to represent the triangular shape of the Star Destroyer. Above the large grey wing is a medium-sized grey wing. At the back of the wing on both sides are 1x1 sloped bricks. At the front of the wings is a dark stone grey radiator piece, with a flat dark stone grey brick behind it. Above the medium-sized wing is a small wing. 4 grey tiles with studs in the middle take up almost the whole wing. A 1x1 dark stone grey tile is on the second tile, while a sloped grey piece is behind it with a 1x3 flat brick, and dark stone grey studs on the left and right of the flat brick, with a space in the middle. The back of the ship has sloped pieces with 4 small slots in it. 3 transparent light blue studs are also in the back, representing the engines and rockets. A Star Destroyer was a capital ship owned by the Republic and later the Empire as well as heavily armed warships in general. Star Destroyers were called this because they were believed to be capable of destroying entire star systems. It was available for purchase in Walmart stores in the US in March 2012. It was released in the UK as part of The Sun / News of the World Promotion on May 23 2012. Facts about "30056 Star Destroyer"
This page was last edited on 9 January 2016, at 07:34.